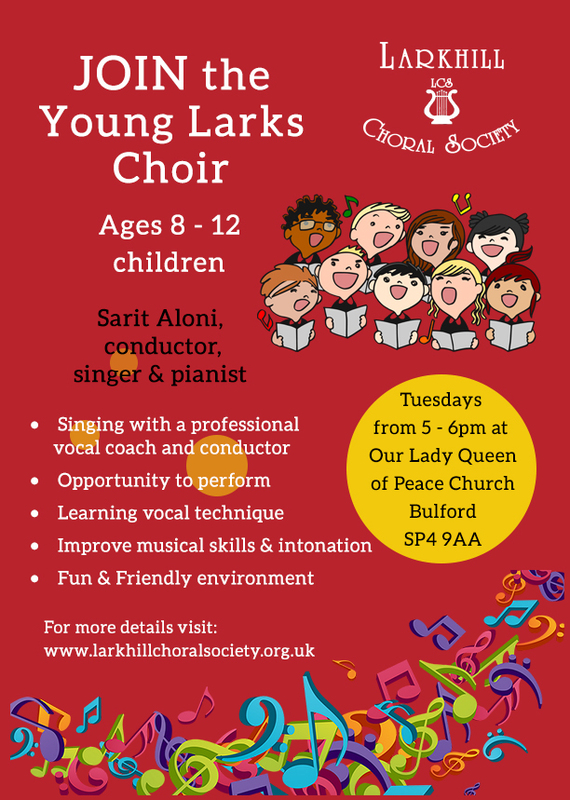 The Young Larks Choir will start its activity on the 6th November 2018 at the RC Lady Queen of Peace Church, Kandy Road, Bulford, SP4 9AA. Children from 8 to 12 years are welcome to join. No audition is required. The choir will be led by Sarit Aloni, who is also the Larkhill Choral Society Music Director. Sarit has worked with youth and children for the last 20 years, has an up to date DBS certificate and is also a mother of two young children herself. Sarit (MAmus) is both a piano and a singing teacher as well as choral conductor. With her wide range of musical skills and knowledge, her choirs enjoy singing together and sharing new experiences. The Young Larks Choir is planned to perform on the 8th of December with carols alongside the Larkhill Choral Society and professional musicians. The term will include 6 rehearsals (6, 13, 20 , 27 November and 4, 7 December from 5 - 6pm) and the concert, which will take place on the 8th of December from 7 - 9 pm at the The Garrison Church of St Alban The Martyr, Larkhill, SP4 8NA. The first rehearsal, 6th November will be free of charge. A fixed fee of £40 (bank details will be given in private after the initial registration) will be charged to include all rehearsals and the performance.